This is a must-read for all sports marketers, but the absence of prescriptions makes it incomplete, says Harish Bijoor. Think sport. think the gold standard event of them all— the Olympics. The Olympics as a sporting movement has gone places over the last 2,700-plus years of it being there as the event of them all. In many ways, the Olympics that happen in two “avatars”—the Summer and Winter games—every four years, rotating themselves across cities and countries and their respective geographies, are the ultimate festival of sporting fervour—the Mardi Gras of sports. Today, the Olympics is also the biggest sports marketing festival of them all, attracting the attention of scores of marketers from hundreds of companies, all salivating at the prospect of the positive brand ruboff from a consistent and intelligent use of the event. It’s a huge commercial festival, and a bigger media event. The Olympics is, therefore, much more than mere sport. It is the peak event of sporting passion, excellence and honour, and most certainly, a mega eyeballs and mega-bucks event. It’s the biggest series event held once every four years. How big? Very big. It is the only true-blue global sporting event. The 2008 Beijing Olympics is estimated to have attracted over four billion viewers (out of a global population of 6.4 billion). What’s more, these four billion viewers are estimated to have devoted viewing hours in excess of 36 billion in watching the 17-day event. Big on eyeballs. Big on focus. Big on passion as well. 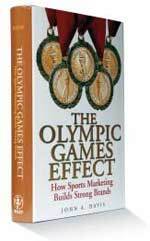 John A. Davis, Practice Associate Professor of Marketing at the Singapore Management University, has put together an active-use tome in this definitive book, The Olympic Games Effect. It’s a book that focusses on the undeniable fact that sports marketing helps build strong brands. Never mind whether your brand has anything to do with sports or not. The event itself is a tremendous high-potential event of high impact value—if used well. Davis really does seminal work on this count. He researches the games from its hoary tradition and history, takes you through the ups and downs, traverses you through clearly delineated sections where you learn Olympic tradition as much as the very science of using the sport to the greatest possible marketing advantage. In many ways, the book helps you pick your way through what to do and what not to. It takes you through brief and well-written cases that tell you what a Visa did right and what possible opportunity was missed. There is a very detailed track of a heritage brand such as Coca-Cola, tracing every year of sponsorship and brand activity involvement over the decades, starting with the Summer Olympics of 1928 in Amsterdam and well nigh nearly with what Coke planned to do in the 2008 Beijing Summer Olympics. Davis does justice to documentation. If not for this one vacuum, the book is a good read. The style is academic and the value immense to a company actually wanting to tread the path of Olympic marketing glory. It’s a good read for those who are in the realm of sports marketing, to those who manage sports stars, to those who work in the medium of sports marketing at large, and, certainly, to those who love the Olympics as a marketing opportunity of great value. The “thrill of victory and the agony of defeat” that Davis quotes in his book could as well be so true of the effort of Olympic marketing itself. In reality, many who have bitten the bait of wanting to be one of those who did a bit in, or with, the Olympics have realised that the event is not a simple one. It is not in winning the sponsorship possibility, it is, indeed, not being one of those in the TOP (The Olympic Partner) programme. Instead, it is how intelligently you use the opportunity so presented. Bagging the sponsorship is but the first baby step in the management of the Olympic marketing programme on the whole. Many have experienced the “agony of defeat” in their Olympic marketing efforts. And, maybe, for every five that have experienced this agony, there could be one that has been through the throes of ecstasy of making it big. The book highlights some points of great use. The Visa example is one—a very detailed example of consistent use of sponsorship for commercial advantage. A definitive use of usage stimulation, brand reach possibility, advocacy creation, demand generation from the travel and Olympic tourism industry and more. The case details the use of a multiple set of formats, starting with sponsorship and moving on to the use of advertising, corporate relations, the product itself and the tool of public relations. The best part of the book is the practical section that has a check-list of how to go about your sponsorship programme and how to evaluate whether you need to be a sponsor. At the end of the read, if you get up feeling that sports marketing is not fun at all, blame Davis. Harish Bijoor is a Brand Strategy Specialist & CEO, Harish Bijoor Consults Inc.
Restructuring is still as important to corporations as it was two decades ago, and this book offers insights into how it can be done well. Why it mattered: Hammer and Champy came along with a radical, startling prescription for overhauling businesses wholesale: “Don’t innovate— obliterate.” It opened eyes to the possibility that businesses had gone very wrong by adopting operational policies that were more inefficient than innovative. Their primary declaration was the need for businesses to identify their most important processes and get as good at those as possible. Among other changes they called for was tearing down the silos that separated functions in most companies. Why it still matters: Though many companies have been at it a decade or more, refining business processes remains a valuable route to differentiation. Getting more done with fewer people, in less time and with less cost will provide a competitive advantage. What to ignore: This was controversial because corporate cost-cutters hijacked its reengineering prescription and used it to disguise and justify mass layoffs. Ignoring the human cost of any measure can doom any reengineering project. While reengineering may entail job losses, it doesn’t have to; there are many other cost-cutting measures whose human costs are less severe.